As the most fan-friendly league in world football today, the Bundesliga remains one of the best attended divisions in Europe. 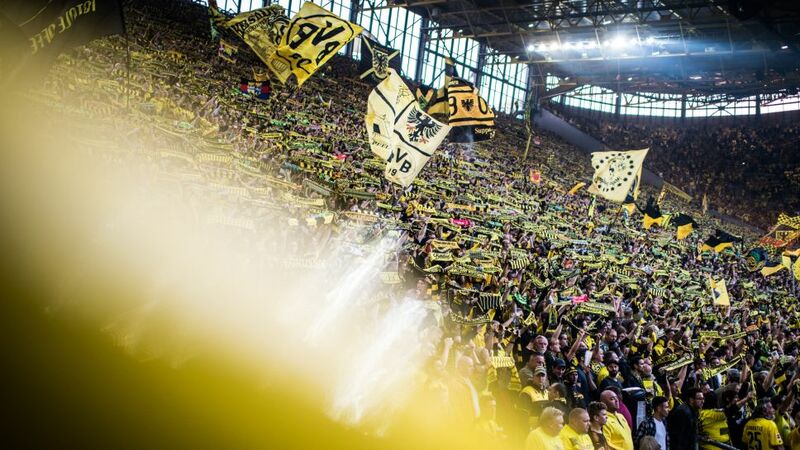 In a study by DeporFinanza, Borussia Dortmund top the 100-club list of average attendances (80,830) - some 5,003 ahead of English Premier League outfit Manchester United (75,027) - with Bayern Munich third (75,000) and eight Bundesliga clubs included in the top 30. All told, 23 Bundesliga and Bundesliga 2 clubs make up the top 100. With the promise of world-class football at bargain prices, it is easy to see why so many fans are flocking in their droves to experience the Bundesliga in the flesh. Tickets can cost as little as £11, while stadiums such as Dortmund's Signal Iduna Park - the first stadium to surpass an 81,000 average spectator mark last season - Bayern's space-age Allianz Arena and Schalke's Veltins Arena habitually serve up some of the best atmospheres club football has to offer. The terraces play their part. Dortmund's magnificent abode, for example, boasts the largest in Europe with enough room for 24,454 bricks in the infamous 'Yellow Wall'. And then there's the obligatory match-day sausage and beer. Whichever club you choose to follow - through thick and thin - the Bundesliga stadia will not disappoint, least of all the 13 with the capacity to house over 40,000 supporters. Click here to find out how to buy tickets to see your favourite Bundesliga club!